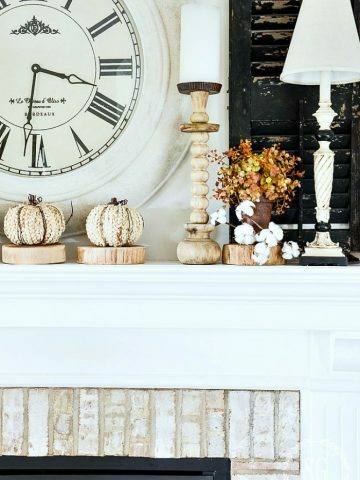 When I talk about mantels it’s like speaking my decorating love language. Mantels are the focal point of a room and what goes on the mantel is more than important for a beautifully decorated space. Mantels used to by my nemesis! I hated to decorate them. Until I realized that decorating a mantel was not much different than decorating any other flat surface, except that it is longer and sits higher up on a wall. 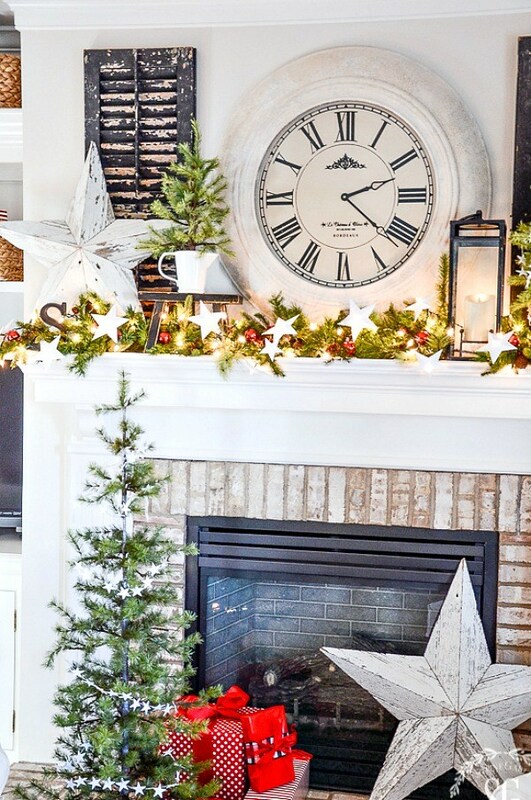 So I looked for a decorating “formula or recipe” I could use over and over on my mantel changing out the elements here and there and still having it look amazing! 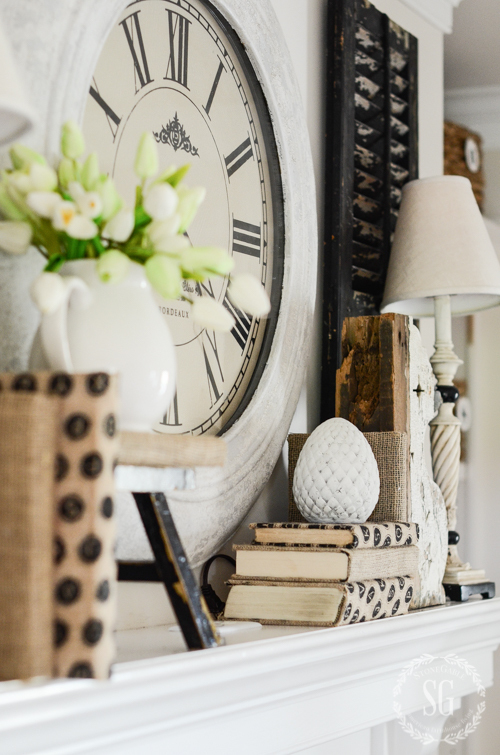 I’ve not only been on a long decorating journey with my mantel… it’s been more of a quest. So today let’s see the evolution of my mantel. The good the bad and the very very ugly! Today on our podcast DECORATING TIPS AND TRICKS you can listen to our latest episode…Decorating Mantels. Just click the little arrow on the left side of the box below. You can find all DECORATING TIPS AND TRICKS podcasts by clicking on the word PODCAST under the StoneGable header. And get show notes there too! And you can listen to all the episodes on your iphone in itunes and on your android if you are on the go! Here’s how my mantel looks today. This image was taken the first year of blogging in 2009! I was just learning about photography and lighting and less is more! I loved this mirror on my mantel because it was the best mirror in my home. But the mirror mostly reflected the ceiling. It finally dawned on me that there had to be something better to put on the wall of this focal point. I wanted something nicer to look at than my ceiling! One smart thing we did when we built StoneGable was to have outlets installed on the mantel. Lighting the mantel with lamps and other lights is so easy! By 2013 I had replaced the mirror with a big clock, painted the living room a dark tan and replaced the 90’s green marble fireplace surround with a lighter brick. I also painted the tall think lamps and added new lampshades to them. But looking back the colors were way to flat! And I still had lots to learn about photography!!! By 2014 we repainted the family room Sonnet by Benjamin Moore, the color it remains today! We also found these cute chippy shutters that are a permanent part of my mantel. We had to retrofit them. They were very long but Bobby cut them down and put them back together so they would be just the right height. You can see a tutorial for resizing shutters HERE. I also found the little black stool that remains a part of almost every mantel I decorate. 2014 was also the year I painted the brass on the fireplace with a fire retardant flat black paint. In 2014 we also installed hardwood floors in our family room, got a sisal rug, had the leather chairs slipcovered in a white cotton duck and bought a new taupe and white houndstooth chair. I found a wonderful chippy window and started using it in place of my clock in 2015. You can hear about it in today’s podcast! The lamps came off the mantel for the fall season. This was also the year I added numbered baskets to my bookshelf to organize my books! 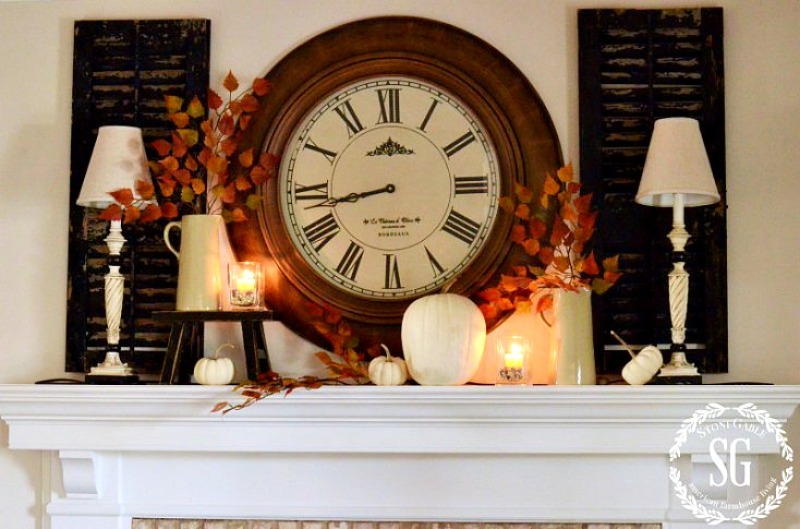 Clock and lamps back on the mantel for winter 2015-16. The clock was a great centerpiece for the mantel, but I had always thought the brown frame was a bit too heavy. So in March of 2016 I repainted it using Amy Howard paints. I’m so much happier with it now! What a journey, right? The evolution of my mantel was slow and had a few detours along the way! But now I think I found my “just right” mantel look! Let’s take a before and after look! You can see how I’ve honed and changed my decorating style, photography, and lighting skills as well as the family room over time. What a difference!!!! I hope this inspires you to keep working on your home and decorating acumen too. 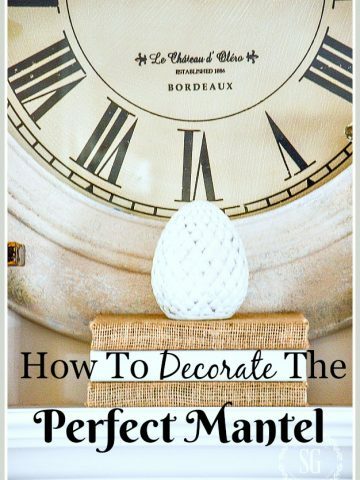 Do you have a tutorial on how you painted your clock above your mantle?? 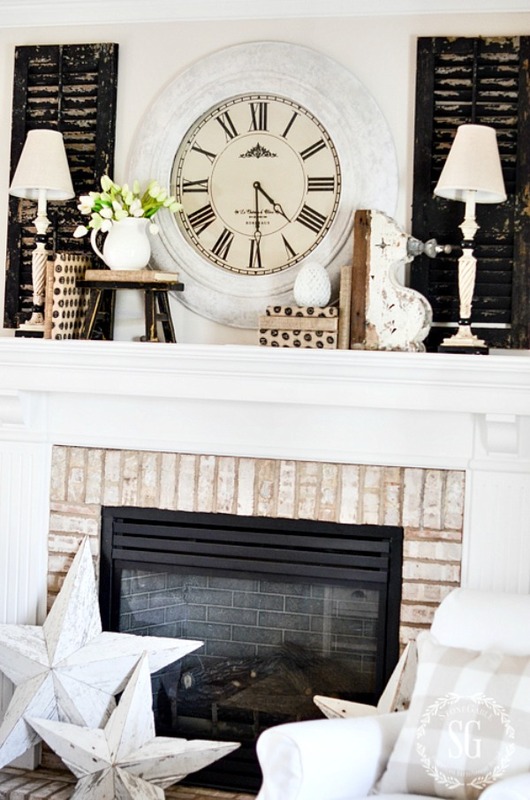 love the black and white neutrals plus wood for warmth…winner! Love all the things you do! love this segment. Have you thought about adding a special segment for those of us toying with the idea of creating a diy mantle or finding an antique mantle and adding it our walls as a standalone wall decor element….without a fireplace insert. I’d like to see how others decorate their walls with mantles but no fireplaces. You’ve Come A Long Way Baby!! 😉 Love the clock with light paint color! Thank you for sharing mantle information. My mantle is my source of frustration as I have cove ceilings and the height issue is my constant battle. Currently my mantle looks as sad as the cold grey rain soaked area that I live in. BUT……thanks to you, I have renewed energy and hope for my mantle. I will try again and again. Love how you change things up in your living space. Always enjoy your blog! Your ideas are always so inspiring! Sorry, I guess I’m just a plain Jain. It is just too much of a good thing for me. Just love the before and after! Amazing how a few changes and additions make such a difference. I have never been disappointed in reading ANY of your posts! You ALWAYS have great ideas, great color choices, and great writing skills! I wish I were YOU!! maybe…some day! I don’t have a mantel?, but it is inspiration for tablescapes! Yes, he really knew what he was talking about there! Great idea! Your mantle ideas are so inspiring. Your mantle is so pretty. I really like the before and after pictures with all the good changes. Love the transformation! What a difference. I agree, I love decorating my mantel,I also add battery lights for all holiday mantels, Target has cute one. This is one of the best blogs! You are such a darling Felicia!!! Thank you so so much! Big hug! I just listened to your blog about decorating your fireplace and enjoyed the pictures. I don’t have a fireplace but I love what you have done with yours. I agree with your comment that “less is more”. My home is decorated in “country” things, so I love your chippy window and shutters, along with the pitchers and organic things. Love your mantle! Love the podcasts! Love everything about Stonegable! Just a few questions – are the leather chairs from previous years the same as the ones that are slipcovered? Did you make the slipcovers? What great style you have. I’ve been studying the clock (which I also love) and finally figured out what was different. I don’t think I’ve ever seen the roman numeral IIII for 4; isn’t it usually IV? 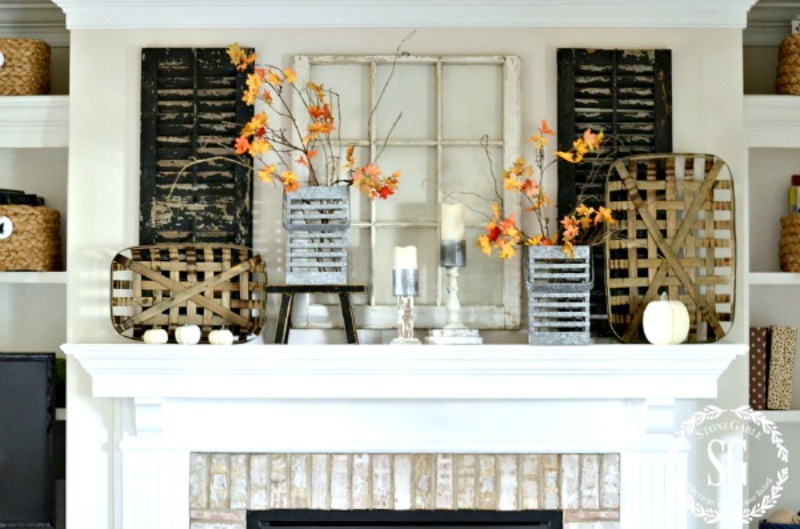 Great mantel ideas. Where do you store everything you are not using!!!! I have a basement and keep them on shelves. Well, it looks like I need a new mantle update! Mine unfortunately looks like your before picture! You are always inspiring me!! I am surprised to find that my wall color and color scheme is so similar to what you used to have. I have to hand it to you for the courage to start all over. I love the warmth of my family room, especially during the winter and at Christmas when it’s so darn cold outside, yet every time I see your beautiful rooms I want to Run out and start buying paint but because its so expensive to change all Ethan Allen furniture On top of buying paint I become stagnant. This post, by far, has been very helpful by showing your home in the before and after pictures. Would love to see more of those types of posts. Helps me get the courage to move from doing nothing because I’m so afraid that I my not like the end result. Enjoy looking at your home and great ideas and now your new Podcasts. Thank you. Had to smile when I read you had outlets installed in your mantle. Daddy had the same brilliant idea 70 years ago when he too installed outlets in the mantles of the four rentals he built! Especially love revolving decor styles and changes you’ve made to your beautiful home without the trendy overkill so popular today. Hope recovery is going well. 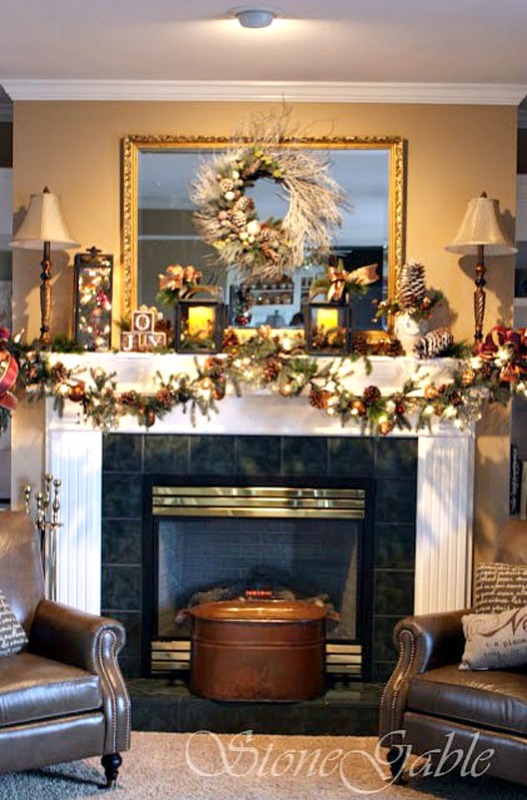 Thanks for sharing all of your great ideas for decorating and transforming a mantel. I love decorating our mantel for different seasons, as well as incorporate my decorating style into it. 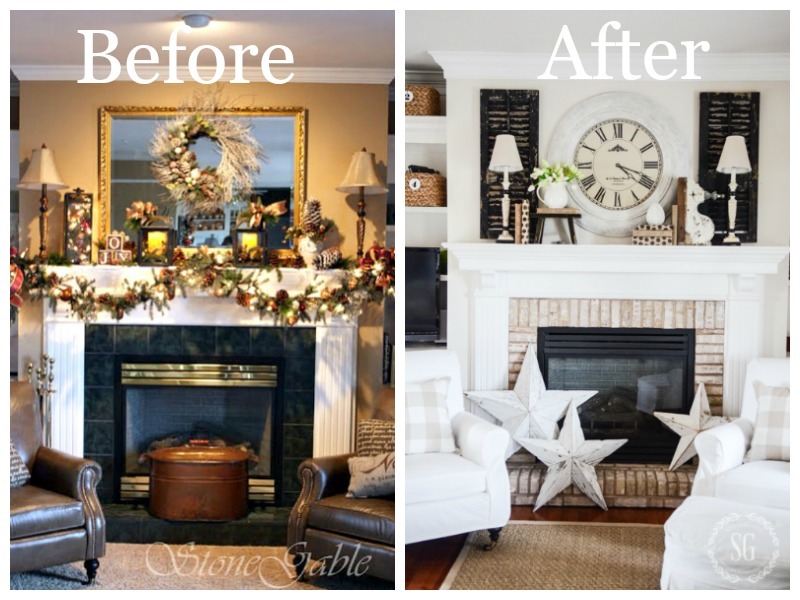 Love the “after” picture and how far your mantel has come! Blessings…. I have enjoyed your podcast, and I really enjoy the blog. I appreciate the links to how to do things you mention. I appreciate your “realness,” especially. :-). I would like to say, however, that each time I come to the blog, I have the thought, “I am going to unsubscribe,” due to the many and obnoxious pop-ups! As I scroll down the page, all this “stuff” pops up and my scrolling interrupted. I understand the need for ads and such, and that this is a business, but please reconsider this kind of advertising. I will probably stay a little longer, but there are so many blogs and I have limited time, that I might discontinue yours (which I love) in favor of a similar one which is not so annoying to navigate. Love, love, love your podcasts and blog. My special treat for myself each day. I need to change my mantle today. Thank you for all your inspiration. I love all the mantle ideas you shared. What a transformation! I like your mantel much better now, but I have to say that I do like when the clock was brown, I think it tied into the baskets so I don’t feel it was too heavy. Having said this, I like it white also! I don’t have a mantel anymore since we moved so all I can do is admire yours. Love your mantel and seeing it has given me inspiration to lighten and brighten my dark mantel! I absolutely love the shutters and have been looking for some myself since I first saw your mantle in a post. I finally found some, only to realize that my fireplace is next to windows that are about 7′ tall with plantation shutters (all along the back of my house). The shutters next to shutters don’t work in my house–on to finding what will! Love your look though!!! I continue to love your blog and your podcasts. They are both a little “treat” for me in my busy day. I take a little time for myself when I read and listen. What a pleasure, and I am learning so much! Your mantle is beautiful and it was so interesting to watch the progression as it evolved over the years. I have a small fireplace with mantle as my house is also smaller, but the tips you gave are very useful, and I can adjust them to my situation. As always, thank you for sharing your wonderful knowledge! Thanks also to Kelly and Anita! Very simplified advice on a sometimes complicated project. It’s funny how decorating a mantel can be such a challenge! You make it look easy, I love your large clock and the big stars! They’re my favorite. I change my mantle at least four times a year. It can be seen from several areas so I like to change things up. Your mantle is lovely but I would be itching to change things around. You always share such great ideas no wonder I’m always fluffing. Your fireplace is beautiful! Where did you find those stars? I am swooning very the stars and an invasion them on my fireplace. Love your mantel! Really love your blog and am enjoying the pod casts as well. Thank you. Yvonne, I wanted to tell you how much I enjoy reading your blog and now listening to your podcast. Hearing your voice brings your blog to life!! It sounds like the 3 of you have so much fun discussing your passion of decorating. Can’t wait to hear more! Thank you, you are so sweet to remind us! All the looks are lovely, the newest mantle design is really great! Pushing Spring…..
Fun to see the changes. A reminder to me that I still may have time to get it right. Or at least better! I love your mantels, especially the corbel, the black shutters and little black stool. I have an 8 foot mantel paneled up to a cathedral ceiling, and when I first started decorating it, everything I put on it seemed minuscule in proportion. I’m learning to use taller, and heftier looking pieces, but it’s still a challenge. Very interesting! I love the March 2016 mantle. Your post couldn’t have come at a better time. I am in the process of redoing my mantle and was relying to decide if I wanted to move from a framed picture to a large clock over the mantle. Yours looks fabulous. i love all your mantel ideas. I’m constantly changing my mantel decor. I’ll be taking down the Valentine decor and replacing it with Easter before long. Did I say Easter? Wow, how time flies. Thank you for the good ideas and I heard the new podcast and love how all of you support and encourage each other. Amazing evolution. I th No I have too much stuff! Thanks for all of the great ideas. Thank you for all your lovely mantel decorating ideas. I have a very long mantel (it’s a full-wall fire place) and I have a very hard time decorating it. I primarily have pictures of my family on it and a few nice decorative boxes. It works ,but I really love your ideas. I’m going to try to incorporate some of your suggestions for my mantel! 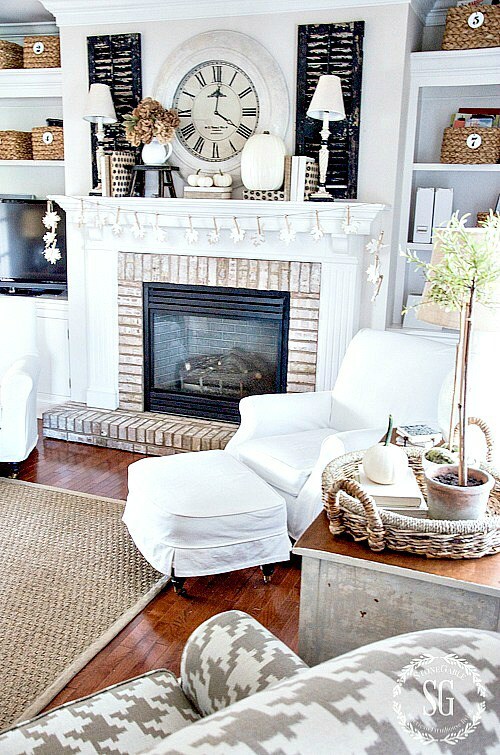 Love the mantel ideas! I’ve been wanting to add to mine. It is amazing how our decorating tastes change over the years. Your fireplace is just beautiful! Love the mantel, you really had good taste. We bought a house recently with a beautiful brick fireplace. Unfortunately it has no mantle. I love your white mantle but we can’t seem to find anyplace to purchase a white mantle. We’ve tried various fireplace stores, websites, even etsy. Can’t seem to find a nice bright, white mantle. We find reclaimed barn wood types. Or poorly distressed pieces of what looks like plywood. Any suggestions from anyone would be appreciated, we actually just want the straight piece and no sides. I’ve looked at dozens of sites on etsy and they are all distressed looking. Thank you in advance. A carpenter in your local area could custom make a mantel easily for you. My mantle needs a make-over! Always enjoy your ideas and the podcasts. Really enjoy watching your mantle decor change with the seasons. It’s always beautiful and inspiring!! My fireplace is getting a facelift and I can’t wait to decorate the new mantle, you’ve given me lots of ideas, thanks! I much prefer the white paint on the clock! Good work! Amazing ideas! I would never guess the chairs are slipcovered! Wow! Loved the evolution of a mantle and so am enjoying the podcasts. What lovely transformation and evolution of your mantel. Keep up the great ideas in this website and on your podcasts. I enjoy listening. I enjoyed seeing the evolution of your mantle. It has looked great all through the years. I particularly like the way you updated the fireplace. I have been meaning to get some heat resistant paint and paint the brass on my fireplace doors. I can’t believe I have lived with it as long as I have! I also want my husband to build a new mantle for our fireplace as ours is just a plain block of oak and I have never liked it. I, too, am in the midst of transforming my mantel. While it looks good, I know it can look better. I purchased some shutters from Wayfair and plan to make them “chippy” and use them on the mantel. 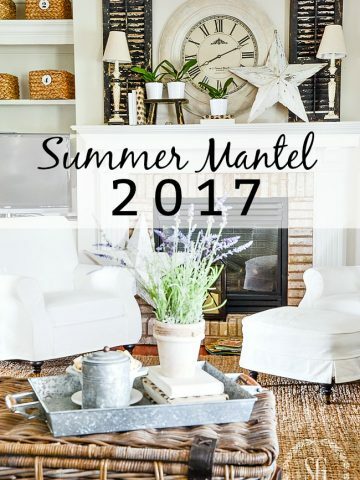 I love how your mantel has evolved, and love your blog as well as the Pod Casts. Good work Yvonne! Hope you are healing and in good spirits! I really love your ideas and decorating!? You are really an inspiration to me and so many others!! Thank you everyday Yvonne!! We’re not getting older, we’re getting better! Love the evolution of your mantel. Your transformation is lovely. It was great before, but I really love the clock. I’ve always been concerned that having a mirror would just leave you with a reflection of the ceiling. Perfection!!! Thanks for all the beautiful ideas. 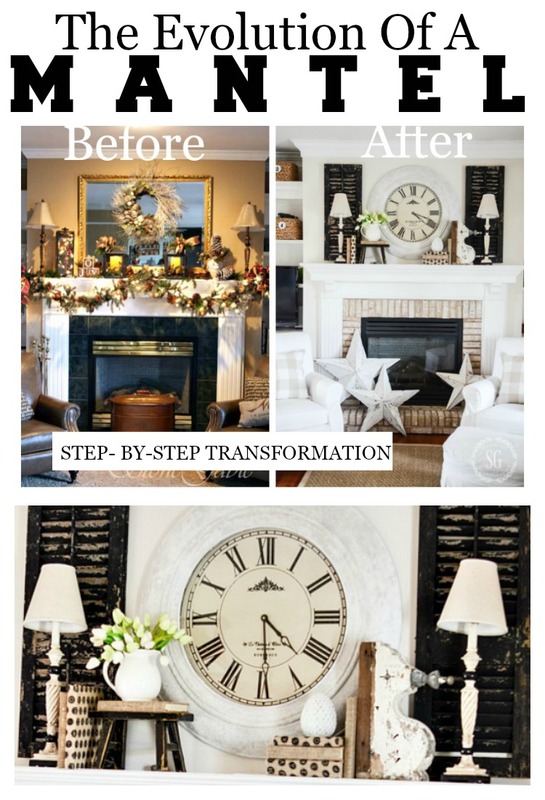 Love the transition – especially painting the clock! A gift card would be lovely! I too, painted my brass on my fireplace black in 2014. What a difference it made! I like a little black in my rooms too. We painted our fireplace bricks white shortly before Christmas, and what a difference it made! I love your tips and tricks and thank you once again for the inspiration. I think anything you do that pertains to home decor is fantastic, Yvonne! I’m also praying for your healing. Keep the faith. Thanks for sharing! Loved seeing the evolution!! I stand amazed. This is beautiful. Love your before and after pictures. Your mantel is gorgeous and I love your shutters. Thanks for including the tutorial about cutting the shutters down to size. I do love your ideas! My project was tu try to salvage the face of the fireplace itself. My fireplace had a thick coat of blood red paint and then a thick coat of white paint over beautiful flagstone. The paint had been discolored by smoke from the fireplace and it looked really horrible. I tried paint stripper to try to get rid of the layers of paint, but it was so embedded into every nook and cranny, I decided it wasn’t practical. Sandblasting companies turned me down because of the hazards of blasting in a house that is inhabited. I really wanted the look of granite or stone. My style is more earthy and nature-oriented than yours, though I certainly respect your taste! I finally decided to try using a Giani paint kit designed to create granite-look countertops. It took me almost 2 solid weeks and many, many layers of paint, but I finally got the look I wanted. Having spent a lot of time backpacking in the High Sierra, I knew very well what granite looks like and I had to keep working on it to get it to look natural. Nobody ever guesses now that my mantel isn’t granite. I added a woodstove fireplace insert, a large photograph by my professional photographer Father of Yosemite, and I am really pleased with the outcome. I need to work a bit more on what goes ON the mantel, but it was quite an adventure in transforming this ugly duckling into something that works for me and didn’t leave me flat broke! I love your mantle ideas. I change my mantle and trays with the seasons. I constantly need new fresh ideas. You are so inspiring. Thank you for sharing little details. Wow! So inspiring and motivating! I’m ready to tackle my mantle right now! Thank you, Yvonne! PS I love the podcasts! Thanks for all your posts ! I enjoy reading them. They are so inspiring! WOW!! You have a beautiful home and I love your style! I enjoyed looking at the ongoing changes displayed with your mantel decor. As I look at your creative ideas, I can see various things I can adapt into my decorating schemes. Thank you. Great ideas! Can’t wait to try them out on my mantel! My mantel is always evolving, sometimes good and sometimes not so. I am always afraid of overdoing. I just can not find a “perfect” solution. Thanks for your help. Love the transformation! I think it looked great all along the journey and love how you incorporate things to make the changes all work together. Love your mantel and the podcasts! The three of you so fun to listen to! Thanks for everything you share! Beautiful! I too have a green marble surround on my fireplace. The white brick looks gorgeous! One of my biggest decorating challenges, but I think I finally have gotten it right! Yvonne, I adore your Classic Style… it is always solid when it is finished. I love a lil bit of black as our New downsizing home has Black Granite on Counters, Island, and the Built in Buffet Hutch, you just taught me how you use black only has the Pop here and there. I wanted to go red with chairs and sofa, but i choose a nice Grey Taupe…so glad I did. I Hope you have a wonderful day ahead! ~ Margo C.
Love the color combination. Love your advice. Your home is so welcoming…love all your pictures and great advice! 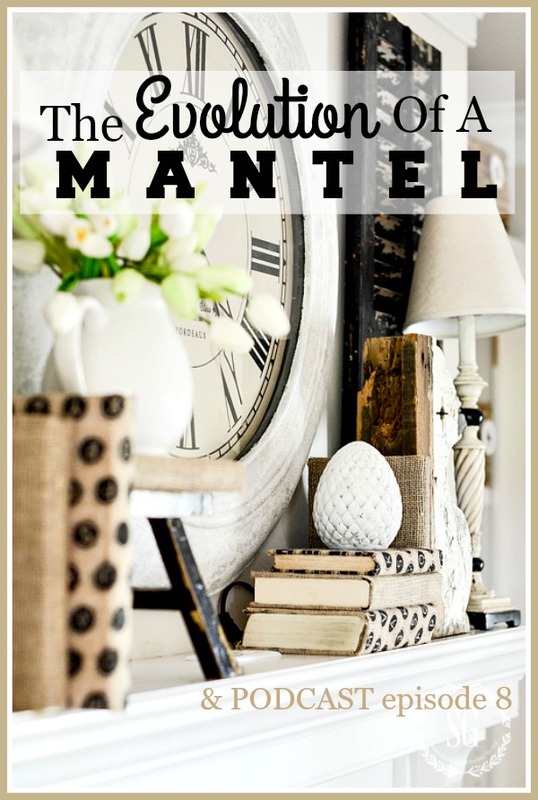 Love your mantel! Thanks for sharing. 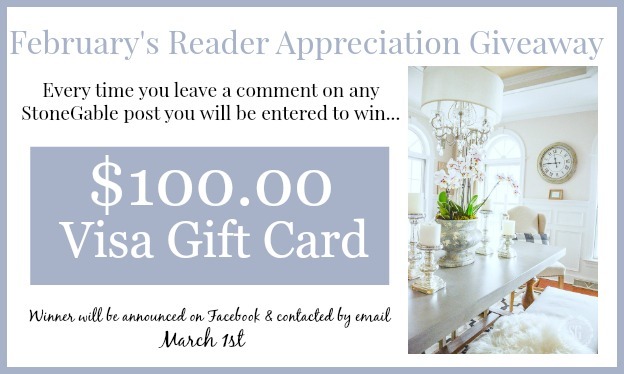 Definitely could use a gift card to buy new spring decor! Loved your mantle topic today. So many good ideas! Love both of the mantels. The soft white is inspiring. Thank you as always for sharing your amazing ideas. I have 5 mantles in my farmhouse. I love the ideas for figuring out how to go about decorating them and hopefully I can do something with 2/3 of them soon! thanks for all the tips and sharing your life with all of us! I have a similar clock above my mantel and love it! I really like the little black stool too. I may need to make a trip to Hobby Lobby and get one of their little stools. I also had the green marble on my fireplace too! Lol! We changed it to a neutral colored stone and it looks so much better. I also painted my (very formal) white mantel to a wood stained look to go with the stone we put up the wall behind the fireplace. My hubby is very handy thank goodness! I love your mantel ideas. I always love changing the look of mine, too! 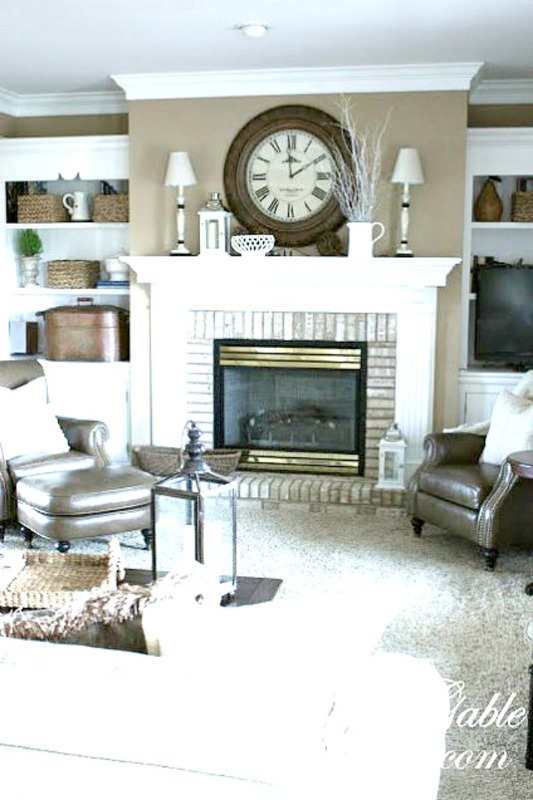 Love your ideas and seeing the mantel change through time is a sort of time capsule! Quite the transformation! It is always fun to see the before, during and after pictures!! Love the “after”! Thanks for the pointers! lover your mantle. The colors are my favorite. Love your blog. always such beautiful pictures and very informative. Can’t say enough good things. Love! It’s so fun to look back at pictures to see how our decorating has changed! Yours always looked beautiful! I have a question about slipcovers since you mentioned that you slipcovered your leather chairs. They look beautiful and look like they fit so well. A lot of pictures of white slipcovered furniture that I see on various blogs or on Pinterest don’t look like they fit and seem baggy. I want to slip cover my leather chairs also, but I don’t know where to buy. Were yours custom made? I find myself trying to imitate your style because I love it so much! I do not copy people often! I’ve always loved your clean, crisp style! I enjoyed your transition so much! After reading, I always take away something I use. Thanks! Your mantel always looks great. I have a collection of original paintings so have one on the mantel. I’d be interested in a discussion of the display of painting as I do not see many displayed in current decorating blogs. I love your podcast and your blog. I try to copy what you do but it does not seem to work out as well for me. I am a work in progress and I appreciate all of your guidance. Yvonne I am so sorry you are in so much pain with your ankle problem. I feel as if I know you and therefore I hate to hear you are in such discomfort. I will keep your healing in my prayers. Think about the behind element first – great idea! Love the transformation! Great job! We recently installed a new mantle and you’ve inspired me! I love your mantel in your family room it looks so inviting and cozy.Thanks for all the inspiration Yvonne you are such a sweetheart.. The “after” of your mantel is beautiful!!! 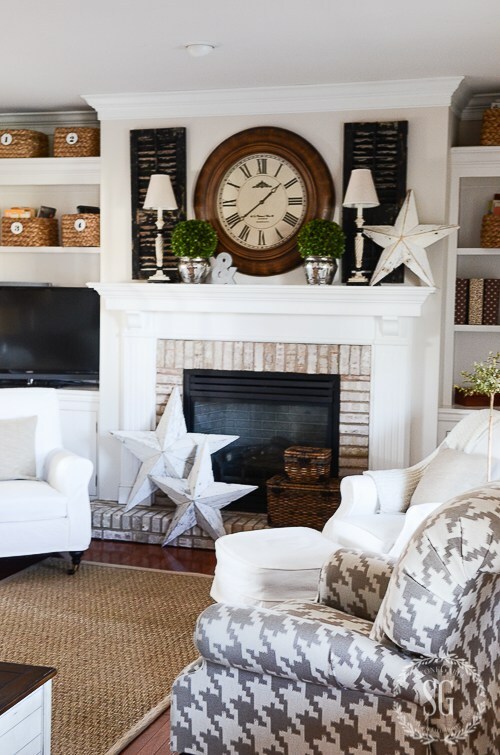 i’m sure that the “before” mantel was lovely in it’s time , but the after is beautiful and very much a comfy ,cozy farmhouse look for a family room…love it! What fun to see your original mirror – exactly like the one I grew up with. When I inherited it from my parents I kept it around because I loved the size and while I wanted to paint it, I couldn’t bring myself to do it. When I passed it on to my daughter, she painted the frame satin black and hung it in her living room. It looks great! I don’t know where my mom got it originally, but it has graced three generations of my family…oh, the stories it could tell. Thank you for all the great information! I am redecorating my mantel today. I have a more unique problem though, since my mantel is a 90 degree corner one behind a wood stove with the stove pipe going up to the ceiling. Good ideas for the mantel. Gives me inspiration for a redo. My goodness, I have the same mirror over my mantle that you had in the “before” pictures! Clearly I need to update things! Yvonne, I have been praying for your ankle pain. I know what it’s like to have pain be your constant companion. I have two, one in living room and other in the family room. Both are very different as the rooms are; one formal the other causal. It’s fun to decorate for the seasons. Even your “befores” are lovely! What did you use to paint your bricks? I can’t wait to show my husband who thinks painting bricks is a never never..
Love the evolution of your mantel and surrounding area. As always, thanks for your tips and inspiration for decorating. Wei love the ” After “. The light colors. Very pretty. Perfect timing. I just recently painted our mantle and fireplace surround, and need to change the decor around. Great tips! Love your mantel – perfection!! Love this. 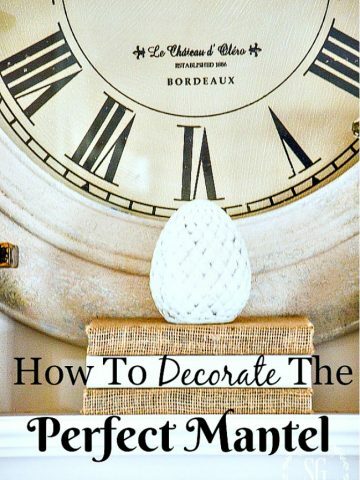 Very helpful to me as I start to decorate my console (that will act as a “mantel”, as well.) Thanks, Yvonne. Enjoying the podcasts! AND, I turned a friend onto them, as well! Always an interesting composition any time of the year. Enjoyed the podcast and love all of your tips! love your covered burlap books! Time to change things up, thanks for today’s inspiration. I appreciate the humility you demonstrate while onmyour decorating journey. Certainly, my taste has changed throughout the years. Always like a before and after. I commend you on the progression of your decorating style and photography! It’s a beautiful mantle and I need to learn from your journey. I have a question about use of stars below on the hearth–when does the use of decorative and beautiful objects start competing with the gorgeous mantle above them? Have listened to every podcast & look forward to the upcoming ones! Each one has been wonderful! As I listened today since Valentine’s Day is now over, I started taking down winter decor and “playing” around with different areas of my living room to transition into early spring vignettes. I realized I should have gathered up all of the winter items before I pulled out the spring decor because right now my living room is a mess as I pick & choose what’s to stay & what’s to go. Since my home is small I need the storage space as I rotate different seasonal items out they’re replaced with the last season’s decor items. Listening to your podcast gave me the idea to take pictures of the contents of the boxes I store my smaller items & candles in, so I’ll know the contents without having to dig through too much stuff. I adore your mantel pictures. I have a dilemma…I have a sloping ceiling with a fireplace that goes to the top. Of course there is the problem of the mantel. I have one piece that I adore, a “mantel clock” of my great-grandmother’s that is a must keep on the mantel piece. While the mantel is oak, the clock is cherry and I can never seem to find the right combo of ways to decorate. The only time I feel it is acceptable is during Christmas. My style is country and I have many pieces I could choose from. Can you help me decorate my mantel? It’s nice to see the “through the years” transition! Looks great today!! Yvonne, I don’t have a mantel at this time but I want to put one in my living room. I have pictured a book shelf on each side of the mantel. My mother had many figurines and I need to display some of them and also have space to store some. We have one large wall in the living room which would be perfect for this. Thanks for the pictures and ideas. Just the info I need! My fireplace / mantel is very difficult and something I continually struggle with. Yours is lovely! Your mantel is one of my favorites! I love the new look of today!